Picture for display only. Different bangles shipped. Our most popular gift! We create the perfect sets for mixing and matching by creating bangle sets that work with each other. Save time and money as you get 5 sets for the price of 4 sets! It's a surprise because I create the sets for you! I custom create 5 bangles sets that compliment each other, in a variety of colors and textures to be mixed and matched together. Order comes with 90 individual bangles. You will get a variety of different colors and textures that can be mixed and matched together. Order comes with the size of bangle you select. If you need specific colors or have other requests, make note at checkout. 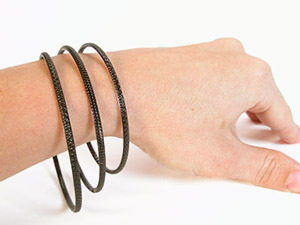 This listing includes our standard bangles. Prism and specialty bangles not included. As expected, fast delivery. Fits well. Bangles are stronger than what I thought. As always, Beachcombers gets it right. Amazing glass bangles in spectacular combos! As always, my custom sets were perfect for the occasion, beautiful and prompt. This is my go to for all things glittery!